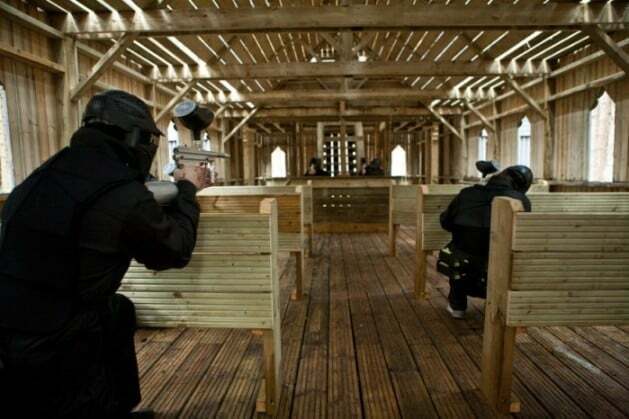 One popular tactic employed by most first time paintballers is to all crowd into the what appears to be the best vantage point or stick together in one part of the game zone. Although sticking together as a team may seem like the best course of action, it is anything but. The opposing team will have a much easier time surrounding your position if you and your team are bunched together. It may seem daunting at first but if your team are split into groups of three or four and dotted all round the game zone. The enemy will have a much harder time advancing if they are being shot at from all directions. This tactic of spreading out also applies to every one of Delta Force’s attack and defend games, such as Castle Wallenberg, Afghan Fort and The Black Pearl. Crowding around what appears to be the best vantage point will just attract a lot of fire, if your team spread out and keep firing you will stand a much better chance of preventing the enemy from completing their objective. We’ve mentioned before in previous blog entries that one of the most important tactics in paintball is to keep moving and any professional paintball player would tell you that staying mobile is relevant to both offensive and defensive strategies. When defending a position, it’s a good idea to appear from behind one part of the cover and pop off a couple of shots, duck down and move to another part as your opponents will be focusing on your original position. Staying mobile on attack and defend games is crucial, some of our marshals have witnessed games where Castle Wallenberg was taken in under 30 seconds and one case where the entire defending team in Afghan Fort where annihilated with a well placed volley of paint grenades. Retreating is always an option. This may sound like a controversial statement but a lot of paintball experts would agree that a tactical retreat is sometimes the best course of action. Over the years we’ve heard a whole host of epic stories involving one over eager protagonist bravely charging to meet the enemy head on sustaining heavy losses in the process and finding him or herself cut off from the rest of their team forcing them to retreat under heavy fire only to recoup and win the game. Retreating is something you should never be ashamed of, it’s always best to be prepared and have a plan B. Learning how to conceal yourself properly or camouflage yourself in with your surroundings is a great way to defend a position. As all paintball guns have limited range it’s sometimes a good idea to remain hidden, wait until the enemy come within range before unleashing a volley of paintballs. Lulling your enemy into a false sense of security and waiting for the perfect opportunity can be quite hard to pull off successfully but it can be very effective when executed correctly. And finally, one of the most important aspects of retaining a good defence is communication. Our regular readers may get bored of hearing it but we never get bored of saying it! Communication is possibly the most vital aspect of any team sport, particularly paintball as you will as much more success as a team than as an individual. Hopefully these tips will be of some assistance for both first time players and seasoned players alike. If you are looking for any more tips and tricks to help improve your game then there are all kinds of useful articles in our blog or if you have any questions about paintballing at Delta Force then feel free to browse our FAQ’s.